I found this recently and just love the message. 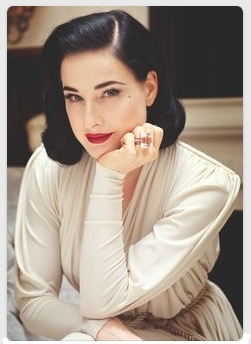 After a little research on Dita von Tesse I became infatuated by her feminine style. You do not have to go far on your Google search to find a treasure trove of beautiful images. No surprise here - She has own line of Lingerie at Secrets in Lace. There is great fashion advice at All Woman’s Talk with eight tips on how to dress like Dita von Tesse - we all wish. In addition, do not forget Pinterest. Even Polyvore has pages of style lay outs on what they call Vintage Pin up featuring guess who?